This printable periodic table is missing a few key parts. The cells are all present in the usual periodic table format. The group and period numbers are labelled and a nice solid line separates the metals from the metalloids and nonmetals. The missing elements are “left as an exercise for the student” as it says in textbooks. Download the PDF and print as many copies as you need. This blank periodic table PDF is optimized to fit on a standard 8½×11 sheet of paper. 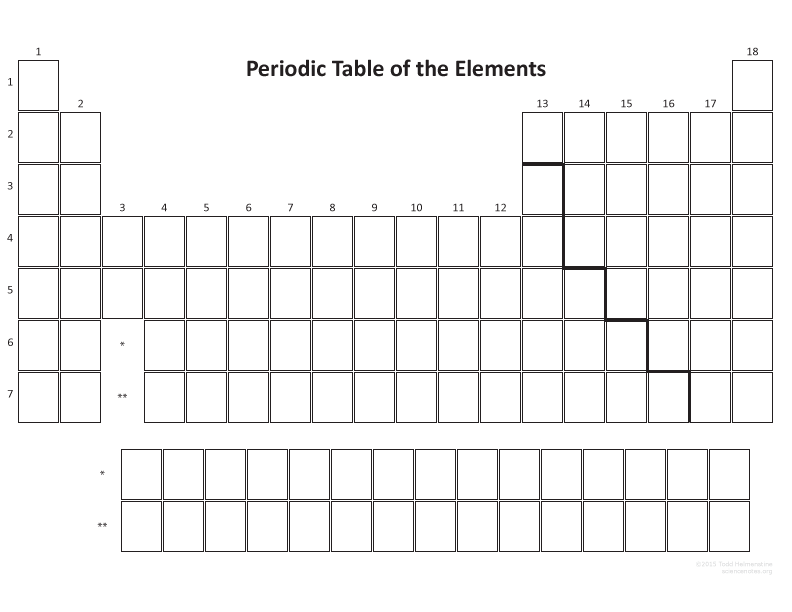 Test your knowledge of the elements by filling this blank periodic table in by memory. Another idea is to copy a periodic table to help memorize the order of the elements. If you need a periodic table to copy, I have a nice printable periodic table with everything filled out for you.